Dinosaurs. These animals that went extinct 65 millions years ago fascinate every child, and adult, don't you think so? 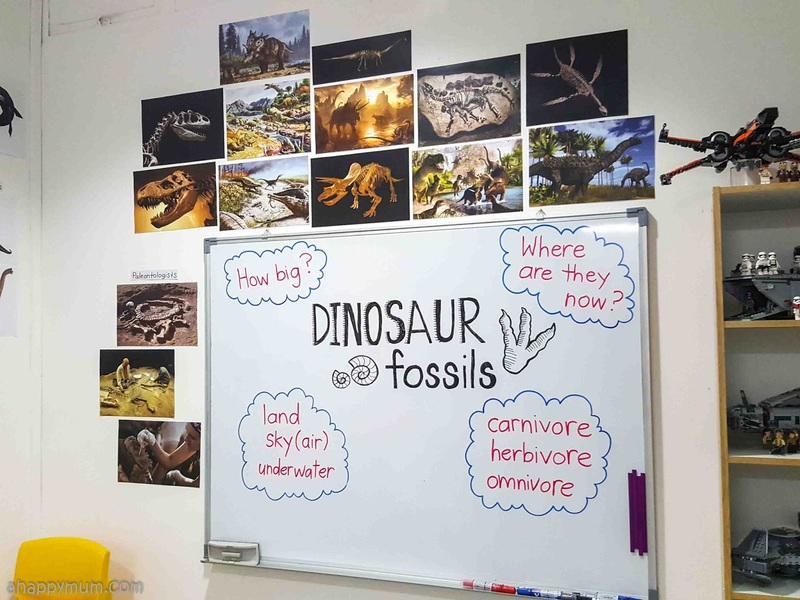 Well, my kids have watched Jurassic Park 1/2/3 and Jurassic World with me, we read books that talk about the different types of dinosaurs and we have visited dinosaur exhibitions that showcase life-size dinosaurs in the Science Centre. While we might never be able to truly understand the mystery of dinosaurs, I think it's good for kids to be exposed to such knowledge at a young age. 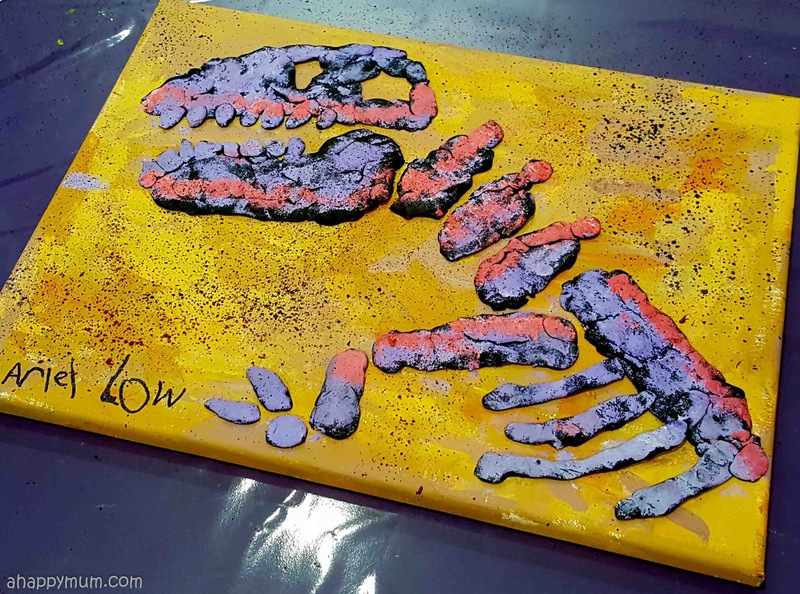 Thus, I was pleasantly surprised when I knew that the theme for Ariel's latest art project at heART Studio was "Dinosaur Fossils". In today's Creativity 521, I'll walk you through a step by step tutorial of how she ended up making a terrific and awesome piece of fossil artwork. Fossils are the remains of ancient animals and plants, the traces or impressions of living things from past geologic ages. The word fossil comes from the Latin word fossilis, which means "dug up". Most fossils are dug from sedimentary rock layers formed from sand, mud, and small pieces of rock. The fossil of a bone doesn't have any bone in it; it has the same shape as the original subject but is chemically more like a rock. 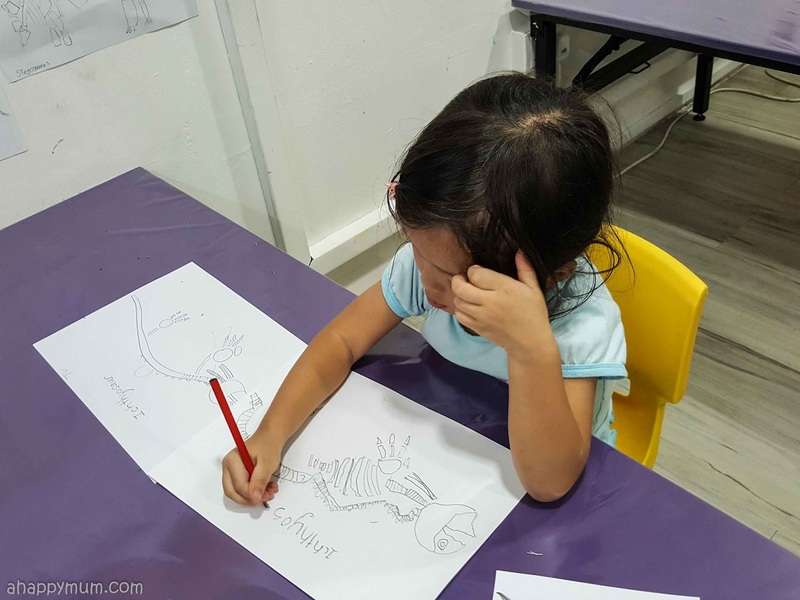 In the first lesson, the kids were taught about fossils and paleontology, the branch of science concerned with fossil animals and plants. Next, they were to pick out their choice of dinosaur from the many which were showcased on the wall. 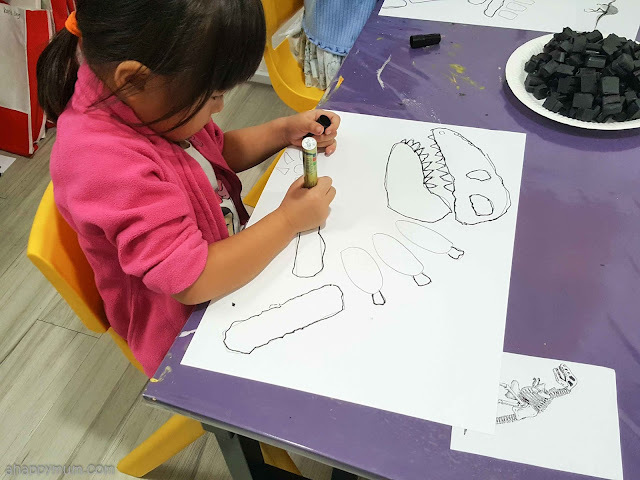 Step by step, they drew the shape of the dinosaur fossils. Now, this is entirely different from drawing a dinosaur body and I must say there were plenty of details involved. What the teachers did was to guide them by drawing on a separate piece of paper and stroke by stroke, the students had to try their best to create their own drawing. 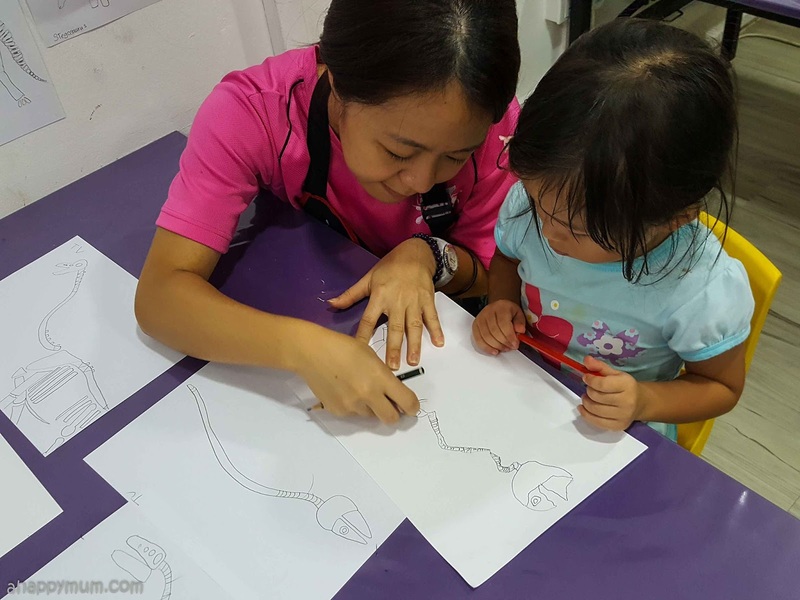 In the second lesson, the kids were in for a surprise! 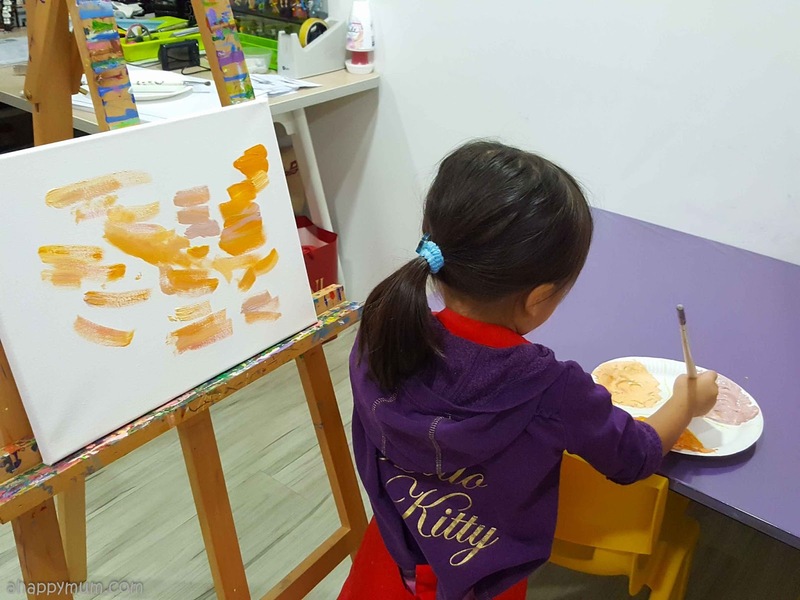 Each of them got to paint using a easel stand and had their very own canvas! See, don't they all look like little Picassos? 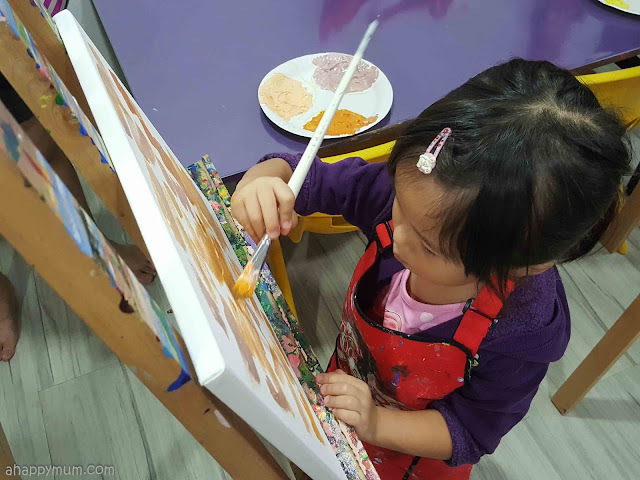 I was very thankful that these young kids had a chance to be exposed to canvas painting and I know that these are really not cheap! 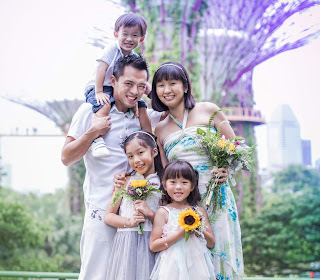 So kudos to heART Studio for giving them such awesome opportunities! What they had to do first was to paint the background. This was done using short strokes and alternating between three different colours of paint. For Ariel, she chose an earthy colour instead of pink, which was given as one of the options, and I was quite glad because I thought it looked very natural after she blended them together. 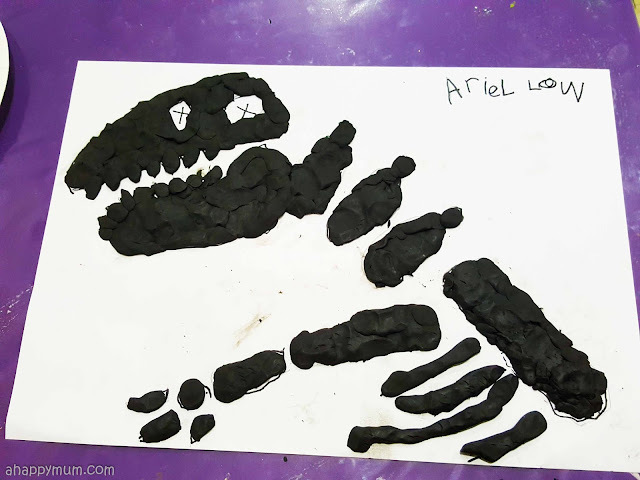 In the next lesson, the kids started work on the fossils. 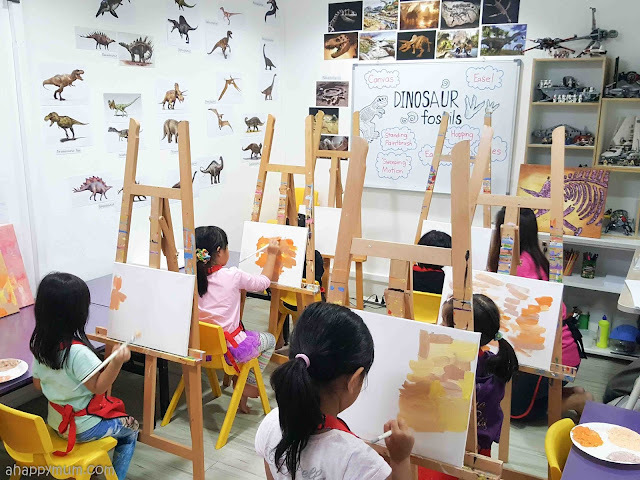 Firstly, they had to pick out another dinosaur of their choice and then trace the outline of its fossils, which had been drawn by the teacher, using a marker. This was a little challenging yet good practice for the little fingers, especially for Ariel as it really isn't often that she draws using such a thick marker. The next part is the most fun one, or so we thought. 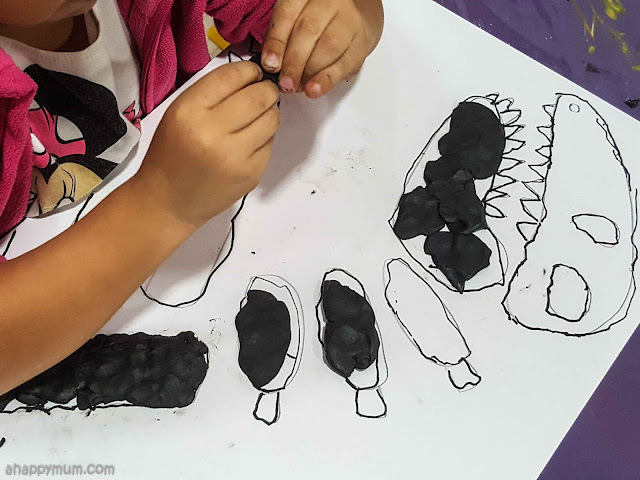 Using black modelling clay, the kids had to shape it in order to fit into the different parts of the tracing. So, they had to press, mould and flatten while ensuring that the shapes of the dinosaur bones were still intact. See? Not bad, right? This was what they achieved by the end of the third lesson for this project, which couldn't have been made possible if without the help and guidance of the teachers. For the fourth and final lesson, it was time to add on some colour! 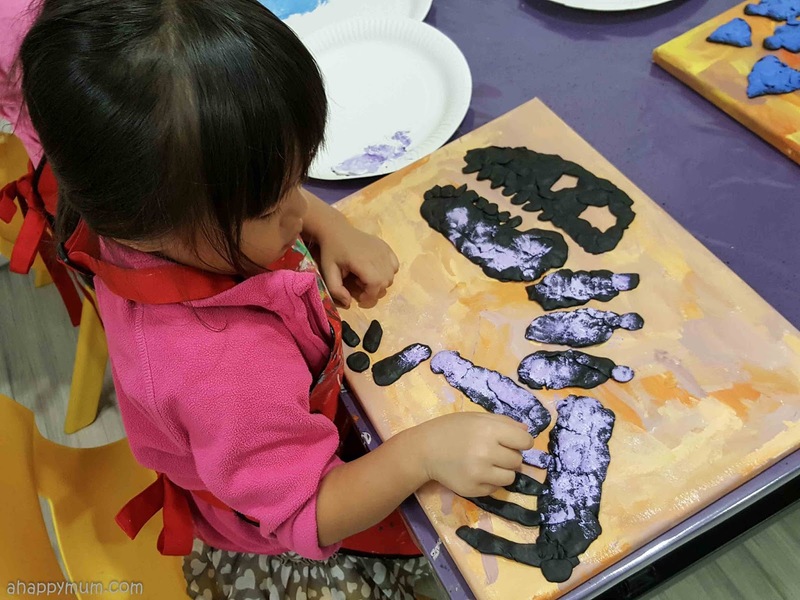 The teachers had painstaking cut and pasted the black fossils from the paper onto the canvas for every student. I can imagine how time consuming it must have been! 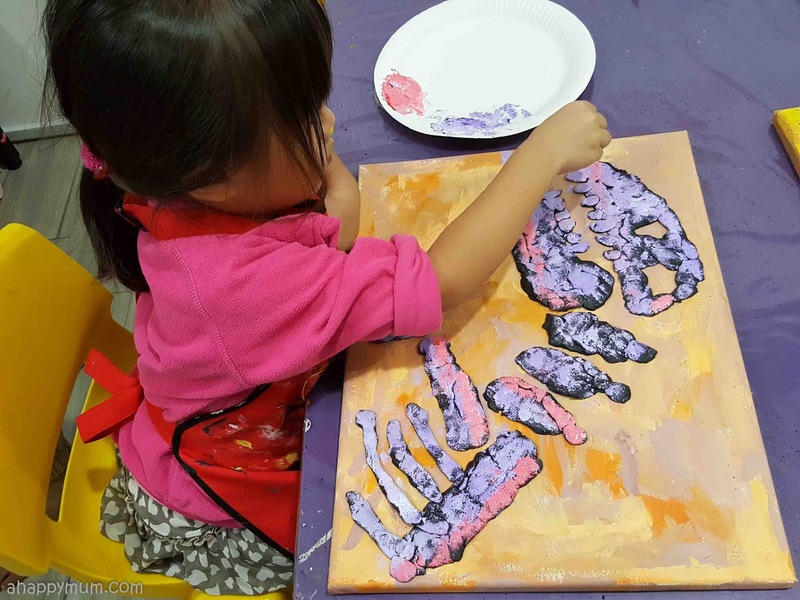 In this session, they were tasked to use a dabbing technique by using a sponge to apply paint onto the clay fossil. To make it more interesting, they had to use two different colours. 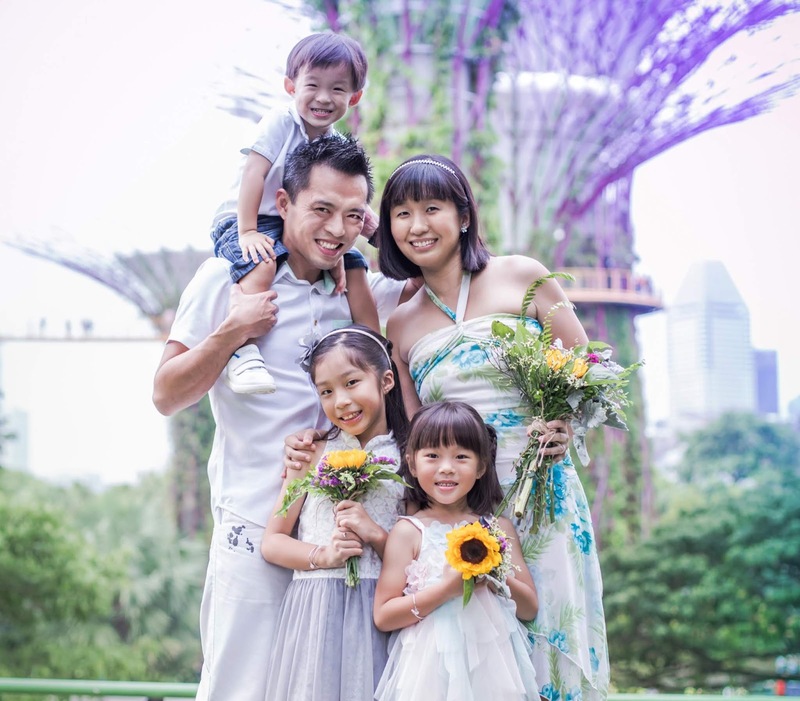 Ariel chose her favourite colour, purple, and complemented it with a pink colour. I thought it made quite a nice combination, right? Lastly, to finish off her masterpiece, she did a little spray painting onto the background by using one paintbrush to hit against another. Looked at how it created a nice splatter of black paint! Ta-dah! Here's her final artwork! 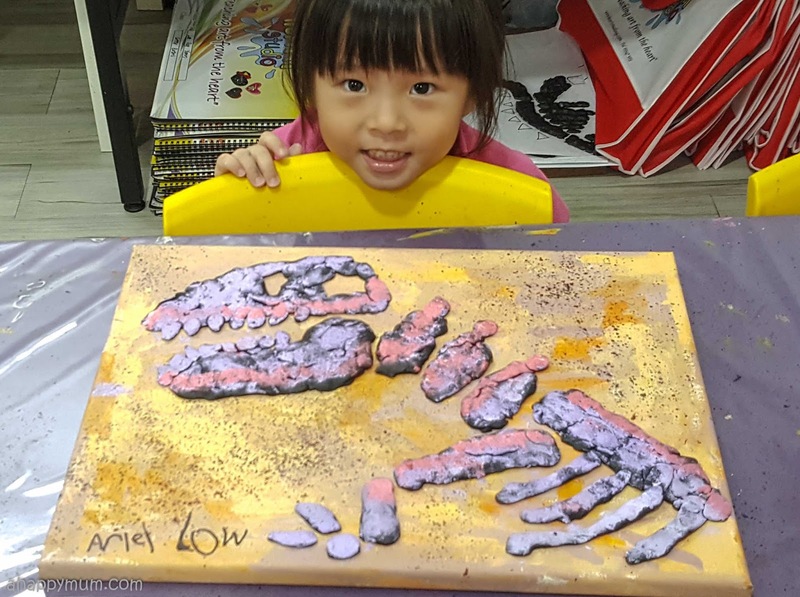 I'm really pleased to see how it turned out and glad that she managed to learnt a little more about dinosaurs and fossils in the process too! This marks the end of our reviews of heART Studio for now but do continue to check out my social media for more of their artwork! P.S. It's been a tough time at home as the kids have fallen sick. 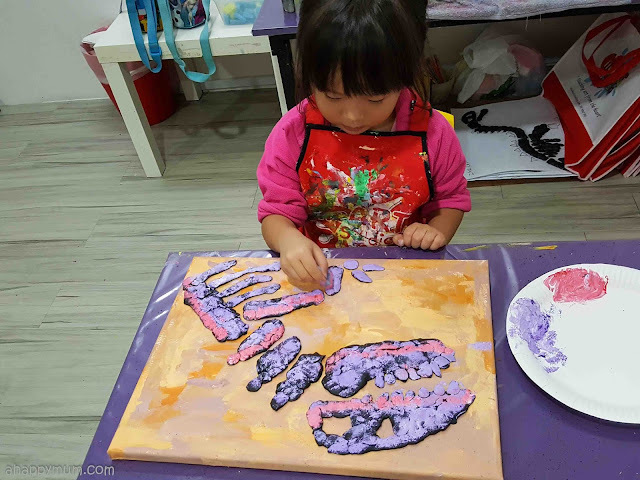 We'll be back in action soon for Creativity 521 when the kids recover and I hope we will have more fun-filled art and craft projects to share!